Microsoft Word Mail Merge is a handy feature that allows you to print your wedding envelopes, place cards, or personalized stationery all at once rather than typing in guests’ names and addresses individually. For a wedding with a guest list in the hundreds, this feature is a not only a time saver, it’s a life saver. Mail merge has several uses, is simple to use, and most people already have access to it at home, making it a great tool for DIY wedding stationery. A database file of your guests’ names & address, table numbers, etc. The merge is completed when the information from the database is pulled into the appropriate place holders in the template, and voila – in no time at all, your envelopes, place cards, or other personalized wedding stationery is complete! On this page, you’ll find all you need to know about using mail merge to print your wedding stationery. 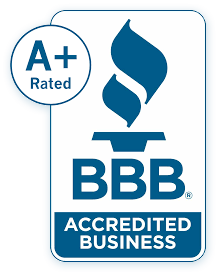 Additional informational articles related to mail merge and printing. Downloading your instructional PDF guide is as easy as 1, 2, 3! Finally, just click to download! The guide is saved to your system and it is there for your access any time you need it! Q: I am having trouble downloading the guide I need. Do I need to purchase the guide, or a program to open it? Our instructional PDF guides are 100% free, and you do not need to purchase anything to view them. If you are having trouble viewing the guide, check to make sure you have Adobe Reader installed on your computer. If you do not have it, it is a free internet download. Q: Do I need special software to use mail merge? All you need to use mail merge and the instructional guides on this page is a version of Microsoft Word from the years 2003-current. Our instructions are available for a PC or a Mac. Q: Are the mail merge guides compatible with other word processing programs such as Microsoft Works, Open Office, or Apple Pages? Although other word processing programs may have data merge features that are similar to Microsoft Word’s mail merge feature, the instructional guides are designed specifically for Microsoft Word Mail Merge. Q: Do I need a special printer to print using mail merge? Mail merge is used only to set up your document before printing, so you do not need any particular printer to print using mail merge. However, you do need to be sure that your printer is compatible with the paper you are printing on. Q: What program should I use to make my spreadsheet? You can use any database program you have to make your spreadsheet. Most people use Excel, as it is often coupled with Word in Microsoft Office Suite. Q: When previewing my merged document, if some of my guests’ information is too lengthy to fit on one line, can I change the font size of just those particular pages? Yes, after previewing, if you find that a place card/envelope looks funny because a name or address wrap onto two lines, you can change the font size of just that particular page without altering the rest. Q: The mail merge instructions for addressing my envelopes are clear, but I am having trouble with the actual printing. Do you offer tips/tricks for printing envelopes? Q: I am printing envelopes using Word for Windows 2007. Is there a way to get the zip code on a separate line below the city and state? I already have it as a separate field in my spreadsheet. As you have probably noticed, when you are prompted to choose a document type in Windows versions of Mail Merge, you have a few choices – labels, envelopes, letters, etc. When you choose envelope, you only get the option to insert an “address block” as a whole, which does not allow you to enter individual fields, and does now allow you to change the location of your zip code. A way around this is to set up a document that is the size of the envelope you are printing. Then, after you open the mail merge wizard, choose Letter as a document type instead of Envelope. This will allow you to enter each field individually and place it where you want it, instead of entering a standard address block as a whole. For more detailed instructions on using letter as a document type in mail merge in Word for Windows 2007, please view the instructional guide under Personalized Stationery. Q: When trying to move the text down in the upper left quadrant of my place card document, the table moves, not the text. Word can be quirky, and this very often happens. A quick fix for this is to place your cursor to the left of the name/table number text. Then, instead of using the enter key to move your text down, hit the space bar a few times to move it right. This seems to “activate” the text movement, if you will, which allows Word to recognize you want the text to move, not the table. After hitting space a few times, you should be able to use enter to move your text to where you want it. Be sure if your table did move, that you use Undo to put it back in the right place. Q: If I am printing single place cards, not LCI’s 4-Up Computer Printable Place Cards, can I still use the Place Card Mail Merge Instruction Guide? 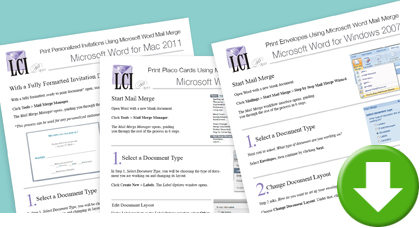 The Place Card Mail Merge Guide is specific to LCI’s 4-Up Computer Printable Place Cards. To print single blank place cards using mail merge, use the Personalized Stationery PDF Guide. Q: What types of projects can I use the Personalized Stationery Mail Merge Instruction Guide for? The Personalized Stationery instructions are most often used for personalized invitations/response cards – for example, We hope you can join us, [guest name]; but you can use it for any personalized stationery or document. Some other common uses are thank you notes, letters, and single place cards. See mail merge in action!